I might be guilty of preaching to the converted here. However, I've heard the occasional lament about an inability to see the differences that Azo can make to print quality - so maybe this will be useful to someone. Whenever talk of Azo comes up, one of the first things folks mention is the long scale of Azo. The term "long scale" has been used in some loose ways - one thing people seem to mean is a material that can accommodate a wide range of negative densities (i.e., a contrast-y negative). This interpretation of the term is problematic because a material can be made to have a wide exposure scale by deforming the curve in some pretty serious ways - pre-flashing the paper (or film) distorts the toe of the curve, for example. Many modern enlarging papers are designed with an enhanced toe to accommodate roll film users and T-max films. Besides, any paper can be made long-scaled by resorting to flashing and water bath controls etc. The cleaner meaning for the term long scaled is probably extended straight-line characteristics. Straight-line characteristics are worth seeking. First, a straight-line print response best preserves the information and gradients in the negative. Also, I suspect prints often look better (i.e., no abrupt increases or decreases in gradation in some area of the scale) although this is clearly a personal, aesthetic issue. Finally, deforming the curve is easy enough with techniques such as the Sterry method (pre-development bleaching), flashing, water bath development etc. However, a straight-line response seems to require co-operation from emulsion characteristics. Now, the consensus is that Azo has a remarkably long scale and yet one would occasionally hear murmurs of trouble getting highlights to print well and blaming Azo's long toe. That was odd in my experience because what first drew me to Azo was the lovely rendition of highlights. However, a visit to Kodak's website helped me understand what people meant. The characteristic curve over there (for Azo in Dektol) did have a pronounced toe. A pronounced toe would allow a long exposure scale but the highlights would display low local contrast. Which was not my experience with Azo at all. I'd used Ansco 130 and always saw remarkably good highlights. So, I set about exploring the sensitometric properties of Azo. I contact printed a step wedge onto Azo and developed it in various developers. The reflection densities were then measured and plotted. Test details: The paper was exposed to a 31-step step wedge. The print reflection densities were read off a Macbeth densitometer - I didn't have the calibration plaque, so I zeroed it off the base white of the paper and went from there. These tests were done at various points in time. The Defender was done first. The Ansco130, G262 at 1:1 and at 1:6 was done at a later point in time, and the Amidol even later. Unfortunately, the paper probably comes from three different batches as a result - I would be surprised if this changes any of the results but figured I should mention it anyway. Chart 1 plots the print reflection densities against the step number. There are a few things worth noting from the chart. There are a fascinating variety of gradations that can be achieved out of one paper. Notice that in the Defender 55 (which is closely related to Dektol), the curve does have a long toe, as suggested in Kodak's data sheets. Even more interesting are the results of the curves for Ansco 130 and especially Amidol - those are almost all straight-line responses. As regards gradation, Azo seems very flexible, as can be seen from the curves. Other papers I've encountered appear not as flexible. I'm guessing most modern papers are designed to produce identical results from processing under a wide variety of conditions i.e., they offer little creative control, although they might yield repeatability for a printer who does not have process under complete control. Plus, of course, most papers are bromide (or chlorobromide) emulsions made for enlargement and as such probably have other design limitations (enlarging papers will require higher speed, for e.g. - therefore the addition of bromide and even iodide). Lots of papers are probably designed with roll film users in mind and have longer toes to accommodate denser highlights. And like I said, I think manufacturers want repeatable results from a wide variety of processing - which I guess is great when one is getting one's process under control, but I'm sure it does impose other kinds of design limitations. Variable contrast papers can sometimes be particularly troublesome. The two emulsions obviously complicate issues (I've seen some D-log E curves that actually had a flat middle portion - due to mismatches in the speeds of the two layers - Ctein reports similar problems in Post Exposure). In other words, it is possible that the inability to get good results from Azo are basically from either process variability or a lack of a grasp on the controls that are possible. The results from Amidol are particularly stunning. Amidol can be a spooky developer - highest reduction potential of any developing agent, even active in acid solution, and does the funny trick of developing from the base up (in acid solutions). It's a diaminophenol, and as such is quite unlike any other developing agent. It's not sensitive to its oxidation product, which means it goes on and on - I suspect this is one of the reasons Amidol provides the straightest D-log E curve possible for a paper. The oxidation product of Amidol is supposedly quite a good restrainer, which might be a reason Michael Smith's formula has the bromide cut way back. And keep in mind that while the Ansco 130 does stack up well against the Amidol, Ansco 130 throws a heck of a lot of developing agent around (metol, hydroquinone plus glycin) - it has to expected that it can stand some ground against a powerhouse agent like Amidol. Besides, Amidol and a water bath make life ridiculously, almost guiltily, easy. 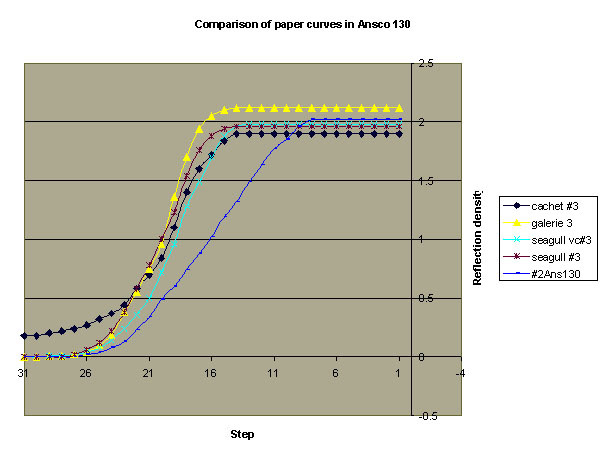 Chart 2 graphs the characteristic curves for Azo, as well as for some enlarging papers, all developed in Ansco 130. 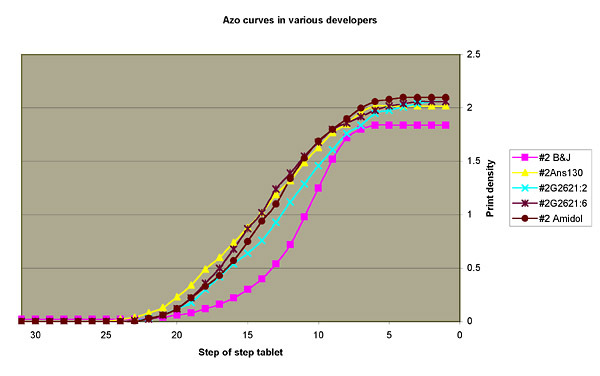 The reflection readings have been speed adjusted to get the curves to overlap to make curve comparison easier. Notice the long straight-line portion of the Azo curve. It is worth examining the straight-line section of each curve and seeing how many steps of the negative (the X axis) it extends over - that would tell you the scale of negative densities that would fall on the straight line portion of the paper curve i.e., be reproduced accurately without further distortions from the paper. Now compare that with the similar exposure scale for the Azo and it should be clear that Azo has a much longer straight-line portion of the curve. (Note: The Cachet paper looks suspiciously fogged, but you could compare the published curves for these other papers - the results are similar). One index that can be used for summarizing this long scale nature is the ratio of the straight line section of the curve compared to the total exposure scale of the curve (i.e., density ranges on the negative that would fall on the straight-line portion of the curve versus the total negative density range that can be accommodated - straight line plus toe and shoulder areas). I've gone ahead and produced a table for what those ratios look like. The ratio essentially tells you how much of the exposure scale of each paper falls on the straight-line portion. This is provided just as a quick and dirty way to get a feel for the differences in the papers. Ideally, one would make multiple readings and so on and utilize some kind of a rule for how much deviation would be required to call something going off the straight-line. I just eyeballed the curves. Here is what those ratios look like. As can be seen, a much greater percentage of Azo's characteristic curve is a straight line, as compared to traditional enlarging papers. That is, the toe and shoulder of Azo form a much smaller part of the exposure scale of Azo as compared to traditional enlarging papers. What this means is that Azo will retain the gradations in the negative with much greater fidelity than the other papers - the other papers will produce greater distortions in gradation due to the toes and shoulders, which make up a proportionally greater part of their exposure scale. I went ahead and plotted a few more curves, since I was at it already. I wanted to ensure the 1 min development time I'd been using was fine. I developed the Azo for 30 seconds, one minute, one and a half minutes and 3 minutes. Chart 3 displays the results. As can be seen from the curves, at 30 seconds the curve has not stabilized fully i.e., it has not taken its final shape, although it is pretty close and development does seem to have been remarkably even. Somewhere around 45 seconds - one minute the curve has achieved its final shape and beyond this time, the curve just starts to drift to the left with increasing time, with no change in its shape. So one could try compensating for mild print underexposure with extended development, although the tone tends to drift towards the cold end of things and other aesthetic reasons typically dictate an avoidance of long development times. In summary, there does not seem to be any good reason to develop Azo longer than a minute - one is better off adjusting exposure and keeping development times to about a minute. Lastly, I tested the effects of a water bath with Amidol. Strips were exposed identically and processed under the following conditions. One strip was given 20 seconds in the Amidol and 40 seconds in the water bath (0:20+0:40). A second was given 40 seconds in the Amidol and 20 seconds in the water bath (0:40+0:20). A third was given 20 seconds in the Amidol and 1 minute in the water bath (0:20+100). 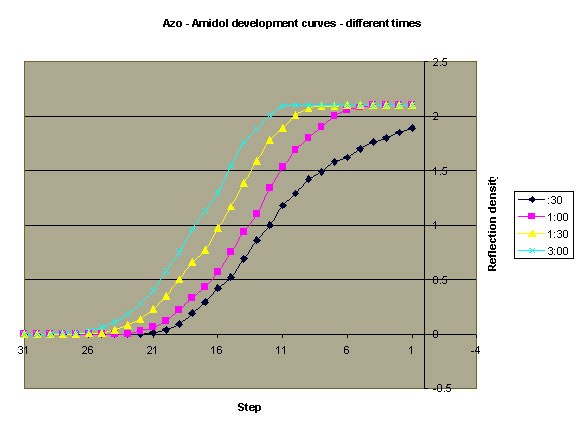 A graph of the standard 1-minute developing time in just the Amidol is provided as a reference point. Chart 4 displays the results. As can be seen from the graph, the curve for 40 seconds in Amidol followed by 20 seconds in the water bath overlaps almost perfectly with the standard 1 minute developing time, which is not surprising given that Azo develops to completion in about 45 seconds to a minute. 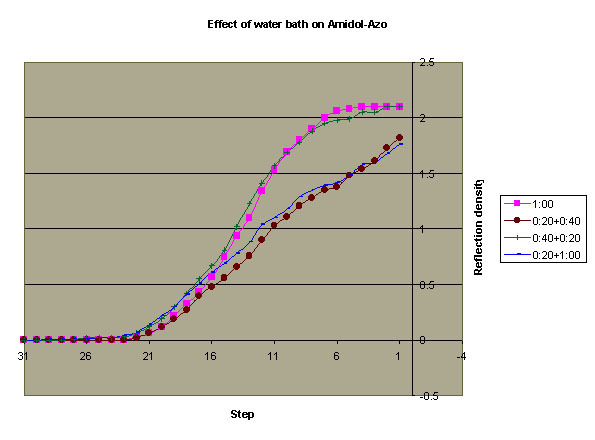 However, the curves for 20 seconds in Amidol followed by a water bath demonstrate a compensating action. Note that the curves still maintain close to a straight-line response, albeit now the curve has a lower slope, a most desirable and pleasing result. Most enlarging papers/developing agents combinations I have examined in a water bath demonstrate little differences in the curve shape from the normal development, except for a somewhat longer shoulder - the rest of the curve would typically remain the same. Combine this with the fact that most enlarging papers do not yield as much of a straight-line response to begin with. So, in addition to an emulsion that has greater distortion to begin with, the water bath with those papers distorts the characteristic curve further by providing an enhanced shoulder. The two curves (20 seconds in Amidol followed by a water bath for 40 seconds, and 1 minute) also reveal the strength of the Amidol. When one extends time in the water bath from 40 seconds to 1 minute, the shadows stay put while the highlights and midtones are elevated. However, I think it's a good idea to standardize the development time at 1 minute (see section above). So, sufficient overexposure would certainly help to control the appearance of the highlights, and moving to the water bath at the appropriate time would help control exposure scale. Best of all, the straight-line response is maintained. And the Amidol avoids the endless moving back-and-forth between the developer and the water bath. First, Azo provides a genuinely long scale (i.e., straight line response) in the appropriate developer. Second, Azo offers remarkable flexibility and leeway for creative control of print tones (but one needs to know how to utilize these controls) - choice of developer, exposure, water bath etc all provide a great degree of creative control without damaging the basic properties that Azo is prized for. Third, Azo is best developed for no longer than one minute - the savings in time are considerable over a lifetime of hundreds and thousands of prints, not to mention the psychological benefits of going into the darkroom with the knowledge that you will get information about a great number of your negatives in one session. Four, the water bath provides a very substantial measure of creative control (unlike most papers where the effects are much more subtle - not to mention the multiple and endless parade between the water bath and the developer). In summary, Azo appears to be the last of the really flexible papers that can yield surprisingly flexible and beautiful results from careful control of gradation.